I’m clinging on to the last days of summer for as long as possible over here in grey London and this salad certainly helps me keep up the charade! 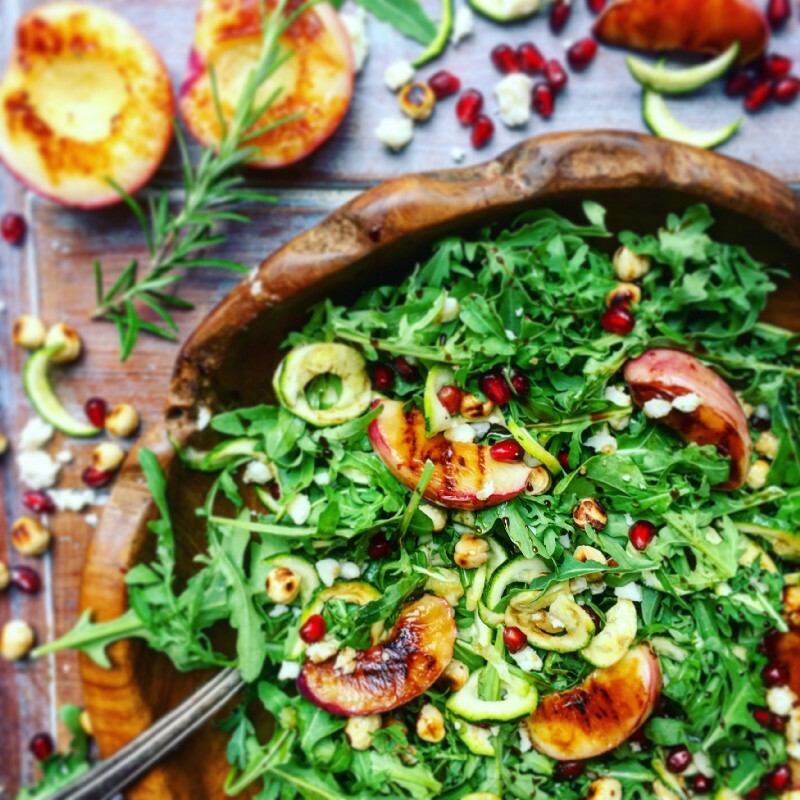 The grilled nectarines are sitting pretty on a bed of Vitamin K-rich Rocket (Arugula) leaves, fibre-filled courgettes and antioxidant-rich Pomegranate. It is then topped off with a sprinkling of roasted hazelnuts and crumbled Feta, although Goats cheese would also work very well here. It was my first time making a Balsamic reduction and adding the Rosemary really took it from tasting very nice to downright delicious! Despite sounding super fancy, it was actually very easy to make indeed — just put balsamic vinegar, maple syrup and a sprig of rosemary in a saucepan and simmer for 5 mins! It will keep for ages, so you have something on hand to very quickly up the flavour profile of any dish. One serving of this salad provides 242 calories, 10g of protein and 5g of fibre. It also provides me with over 50% of my daily Vitamin C & Vitamin A requirements; which is great news since my little one has a virus at the moment, so I need to arm up, so to speak, to protect myself! · In a saucepan, heat the Balsamic vinegar, maple syrup and Rosemary over a medium heat. · Meanwhile, cut the nectarines in half and brush lightly with olive oil on the cut side. · Place cut-side down on a griddle pan over a medium heat. · Cook for 5 minutes until just starting to brown. · Set aside to cool slightly while you assemble the rest of the salad and drizzle with the balsamic reduction. · Optional — I prefer to roast my hazelnuts as I think it really adds to the flavour, but it is not necessary if you are short on time. This can be done one of two ways: either by roasted them in a pre-heated oven for 10 minutes, checking frequently as they can burn easily; or else dry frying them in a clean oil-free dry frying pan over a medium heat for 5 minutes. Again, it is important to shake them regularly as they can burn pretty quickly.